"Quality animals combined with well seasoned trainers gives you the most entertaining, diverse and hands on show in South Florida!" Connect with us on social media and buy our new music album via iTunes and Amazon! Want to donate and get our new digital album for free? click here! Or we can customize any exhibit to tailor to your event, priced by quote. To see the animals available for custom exhibits you can Meet the Animals. Themed Exhibits are available, but costumes must be provided (except for "Snake Charmer", shown below). Hawaiian Luau with tropical birds and alligators, and the ever popular Snake Charmer. Use your imagination, we'll supply the animals! 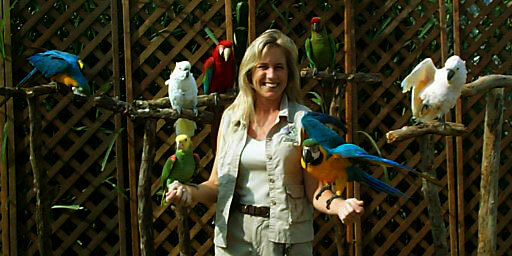 Six tame, friendly tropical birds on perches that can interact and can be held by guest. You may also set up a photographer to take shots of the guests with birds. Includes one trainer. For a lower budget, we offer the "mini display" with four birds at $350 per hour. One lovely lady with a very charming snake. We provide the trainer, costume, and snake; you provide the scenery. Includes one trainer. 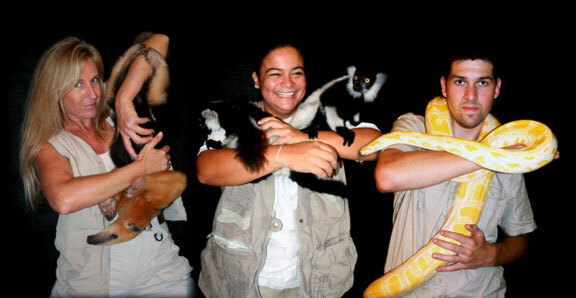 Three trainers bring out animals and mingle with guests, walking around with 10 different animals at 20 minute intervals. This is a great cocktail party exhibit that's sure to keep them talking. Guests can interact and hold many of our animals if they desire. Great photo opportunities for corporate parties! This is also an excellent choice for a large party where guests are continuously mingling. For a lower budget, we can offer two trainers with the same animals for $400 per hour.